If you did not know, the oldest city in the United State States is in Florida, St Augustine and I was determined to get to visit this historic city. I thought how unbelievable it is that I have lived in Florida for 20 years and never visited this landmark city. When driving from Jacksonville South on A1A, the view is quit exhilarating of St. Augustine because you will travel over Vilano Causeway, which gives you a great view of the city, and Castillo de San Marcos, the Fort that guards the city. I was excited to see what other historic sites and surprises the local area had to offer. Historically, St. Augustine was established in 1565 by Don Pedro Menendez de Aviles, and is the oldest permanent European settlement in the continental United States. For 235 years it was the political, military, and religious capital of the Province of Florida from which Spain exercised jurisdiction over a vast geographical region. This town’s principal value, however, was as a military base for the protection of Spain’s colonial trade and commerce which was flourishing at this time in history. The old fort that was meant to protect the city is something to see. The construction of Castillo de San Marcos began in 1672 and was completed by 1695. 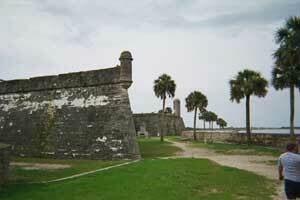 The Castillo replaced nine successive wooden fortifications that had protected St. Augustine since its founding. Community and street grid design in St. Augustine is perhaps the earliest example of this type of planning within the continental United States. This is exemplified by it regular and narrow streets, a pleasant central plaza, abundant open spaces, beautiful patios and gardens, impressive government and religious buildings, and comfortable homes. These attributes suggest an emphasis on the development of an orderly, dignified, healthy and pleasant environment. I loved traveling through the cobble stone streets and observing the lovely architecture. The city is very pedestrian friendly and to see the city, you can begin by parking your car at one of the municipal parking lots on Cordova Street and begin your journey through the city. Before you start your adventure, stop by any gift shop or hotel and get a visitor map with the street layouts. You can, realistically, walk the entire city in one day. There are plenty of tour guide services, buses, horse drawn carriages, and walking tours. You can always try it on your own. If your time permits, you might enjoy a guided tour that will provide you with plenty of details on the history of the city. place to start your tour of the city. There is a cost to go in and you need to be there before 4:30pm, which is the last tour of the day. The other cultural attractions to explore are the Colonial Spanish Quarters, Oldest Wooden School House, Old St. Augustine Village, the oldest house, Flagler College, San Sebastian Winery, and Old Florida Museum. If you enjoy the more mainstream attractions you can spend time at Ripley’s Believe it or Not or Potter’s Wax Museum. I had visited St. Augustine in the month of August which can be very steamy and hot outside. I had jumped into some air conditioning when I had an opportunity and this was a pleasure to break up my city journey. The city has plenty of shops and restaurants where visitors can cool off. The streets are lined with trees, which can bring be a reprieve as well. Sunscreen is must for your journey. The fall and spring months offer the most pleasant weather. The winter months can be very cool, even cold. You should pack and dress accordingly. One of my favorite finds was off the beaten path, the National Cemetery which is near San Salvador and Charlotte Streets. This cemetery houses the gravestones of soldiers from the Seminole-Indian War, which took place from1835 to 1842. This is where General Dade, which Miami-Dade County was named after, and his troops are buried. The Seminole-Indian War ended up as the worst defeat of U.S. troops to the American Indian outside of the George Armstrong Custer’s battle. Major Francis L. Dade and 110 soldiers, many of them artillery units, formed in Fort Brooke (Tampa) and were sent to bolster forces at Fort King (Ocala). Halfway to their destination they were ambushed by a large band of Seminoles and their slave allies, at a site where many of the Indians hid in the unlikely spot on a lake bank. Only a few soldiers escaped the attack. If you want a break from the city of St. Augustine, a little off the beaten path is St. Augustine beach which is not well known and or well used. You can drive about 20 minutes to the beach and take advantage of the FREE parking. At night, they have lighted volleyball courts to play beach volleyball for free. The courts stay lit up till 11pm during the summer. It’s a great way for a family to have fun with very little cost. You just need to provide your own volleyball. For 50 cents visitors, you can walk the mighty long fishing pier at St. Augustine beach. Put aside a full 2 or 3 days to truly explore and experience St. Augustine, and its surrounding attractions, like Alligator Farm or Swimming with Dolphins St. Augustine. As you can imagine, there are numerous quaint bed and breakfasts to stay in. You can choose to camp, my favorite form of lodging. Unfortunately, there are not a lot of options for camping in St. Augustine. Anastasia State Park seems to be the only game in town. Anastasia State Park is a nice place to stay but certainly not the best. The scenery isn’t bad. It’s the noise that makes the difference. State road A1A is adjacent to the park and at night the sound of the road is deafening. If planning to camp at Anastasia State Park, wear your earplugs and don’t expect the frogs and crickets to lull you to sleep. I do, however, give the park a positive review on the cleanliness, and its location adjacent to the beach. Following a short hike, you can walk and swim on the beach. The beaches in North Florida are expansive and wide with plenty of room to roam and play. My favorite, the ocean has plenty of pleasant waves to body surf. Eating establishments are abundant throughout St. Augustine. Surprisingly, the only place that was recommended to me was the Seafood Kitchen at 108 Anastasia Blvd; 904-819-0082. The menu had a variation of combo plates, including fish and shrimp, shrimp and scallops, and a regular fishplate featuring local catches. The portions are huge, with nice side items and very reasonable prices. I had a grouper dinner for $10.95. The food was a little over cooked, but tasty. I would recommend you give Seafood Kitchen a try. Anastasia State Park is located at 1340A A1A South, St. Augustine, FL 32080-5422; 904-461-2033. You will need to call to make reservations if you plan to stay at the state park and camp. RVs are allowed, and the park provides electrical hook ups. The cost is $17.44, and $19.56 with electrical hook ups. To Get to St. Augustine is very easy just take I-95 to Exit 311 or 317 and follow the signs to the city. To recap, if you live or visiting Florida, you need to visit St Augustine at least once, I plan to go back again with my wife and explore some more with her. I hope you enjoy this historic city and all that is offered in the surrounding areas.